Rhinoplasty, also known as nose surgery, not only improves the aesthetic value of the nose, but can also help improve the balance and harmony of a patient’s face and as a result, improve self-confidence. A rhinoplasty may also benefit those with structural abnormalities that cause impaired breathing. Having the training in facial cosmetic and craniofacial surgery, Dr. Totonchi has a great passion and extensive experience in performing rhinoplasty surgery on Cleveland patients. He has multiple publications in the field of rhinoplasty and he is also active member of The Rhinoplasty Society. A rhinoplasty can allow for changes from minor to dramatic alterations to be made to the nose. The size of the nose can be altered to achieve balance with other parts of the face. Alterations can be made to the width of the nasal bridge. The nasal profile can be improved by smoothing bumps and indentations. Changes can be made to the angle of the nose in relation to the upper lip to alter the nasal tip and to restore proper nasal symmetry and correct deviations. Dr. Totonchi can also improve or restore the appearance of the nose due to an accident or trauma. A rhinoplasty is considered a cosmetic procedure while a septoplasty is a corrective surgical procedure to straighten the nasal septum. 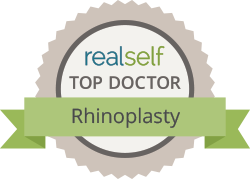 A septoplasty can be done in conjunction with a rhinoplasty if needed. Dr. Ali Totonchi has great passion and appropriate training to perform rhinoplasty, also known as nose surgery. A rhinoplasty is performed under general anesthesia. There are two approaches to reshaping the nose, open rhinoplasty and closed rhinoplasty. Closed rhinoplasty incisions are made inside the nose cavity, while open rhinoplasty incisions are made to the columella, which is the strip of tissue that separates the nostrils. An incision made through these areas will make the incisions inconspicuous. The tissues will then be raised to access the underlying bone and cartilage tissues in order to make necessary repairs or alterations. Once the desired nasal contour is achieved, the incisions are closed and are lined along the natural creases of the nose to reduce visibility. Dr Totonchi although performs both approaches but mostly prefers open technique for fine work and to achieve your desired goals and nasal modifications. If any augmentation is needed at any area of the nose, this can be achieved by harvesting cartilage from the septum, ear, or chest wall. If there is need for a cartilage graft from the ear or chest wall, the procedure will be discussed with you at your pre surgical consultation. What should I expect after rhinoplasty surgery? A splint will be placed outside the patient’s nose to help support the new shape as the nose heals. In the case of septoplasty, or straightening of the nasal septum, Dr Totonchi, will use nasal stents inside the nose which are removed in 10 days to 2 weeks after surgery. You should expect your incisions to heal after about one week. The swelling and bruising will remain for a few weeks after the procedure. Do not be alarmed if the swelling comes and goes during recovery, this is completely normal. You may be required to tape your nose to minimize swelling and promote healing after the stent is removed. Once the swelling subsides, you will begin to see your new nose contours define and develop. Your new nasal contours will fully refine about a year after your rhinoplasty. When can I take a shower or bath after nose surgery? You may wash your hair and body as soon as you feel comfortable doing so, but keep the nasal splint and dressings dry. Discomfort typically lasts 3-5 days, but sometimes longer. As you feel more comfortable, your need for pain medication will be less. Do not drink alcohol for 1 week after your surgery or while taking narcotic pain medication. Generally speaking, patients are able to drive about 7-10 days after surgery. You should not drive if you are still taking narcotic pain medication. When can I resume my exercise routines? On the day of surgery and for 2 days after, please avoid exertion, straining, bending or lifting. I encourage walking short distances the first few post-operative days. Avoid heavy exercise until we discuss it at your first follow-up appointment. What can I expect post-op for my rhinoplasty surgery? You will normally be seen in the office within 1-2 weeks of your surgery, and then about 2 other times in the first couple of months. You will then be seen periodically to monitor healing. We follow Rhinoplasty patients up to one year after surgery. If you are interested in rhinoplasty in Cleveland, call today to schedule a consultation with Dr Totonchi, (216) 778-2262. All photographs and other material presented on this website are the property of Dr. Totonchi. Please do not download or reproduce the images without the express written consent of Dr. Totonchi.